Tradition miso is aged in huge, hand-made wooden barrels for two years. Notice the rocks on the top of the barrels, used for weight to squeeze the miso. 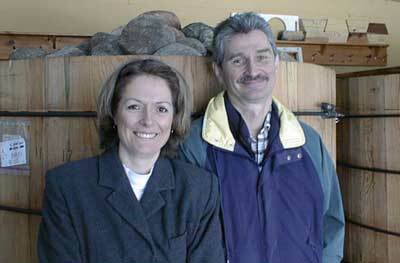 At Tradition Miso, Jerry and Suzanne do everything from assembling the equipment to putting the labels on the jars. It's all a labour of love. Jerry is a veteran in the health food business. He is one of the founders of Toronto's legendary Big Carrot and an original co-owner of Timbuktu, one of the largest and most successful distributors of organic and natural foods in Ontario. He has travelled extensively across Canada, the U.S.A. and Japan to gather the knowledge and techniques necessary to produce and sell the best in pure, natural food. Suzanne has worked by his side, through all this, and they both firmly believe in the power of good eating and a healthy lifestyle - all of which is reflected in Tradition Miso.